In around 1860, moves were being made by the Roman Catholic hierarchy to establish a Reformatory for Catholic girls in the north of England because the only other such institution, Arno's Court in Bristol, had become full. In January, 1861, a meeting of the supporters of the Catholic Boys' Reformatory at Market Weighton was held at Harker's Hotel in York. The gathering heard that Sheffield had been identified as a suitable central locality and that the Daughters of Charity of St Vincent de Paul had offered to undertake the management of the reformatory if they were found a suitable building furnished for the purpose. A suitable property for the scheme had been purchased at Howard Road, Howard Hill, in the Walkley district of Sheffield. The building, known as Howard House, came with three acres of land and could accommodate up to fifty girls, with scope for being extended if required. The premises were then still in use as a boarding school, but a deposit had been paid on account towards the purchase price of £1,450, with the remainder needing to be found by March 25th. With contributions of £100 each from the Dioceses of Beverley, Liverpool, Salford, Nottingham, Shrewsbury and Hexham, and a generous donation by Robert Gainsford of Darnall Hall, Sheffield, the money was raised in time. On July 26th, 1861, the Reformatory was certified to receive up to 20 girls. On August 15th, the Sisters' section of the premises — the original Howard House, now known as St Joseph's Home — was formally opened by the local parish priest, Father Burke. The whole establishment was under the charge of Miss Elizabeth Crawford (Sister Stephanie) who was appointed from an existing community of the Order based at Solly Street, Sheffield. An official inspection in October, 1862, recorded that the girls were employed in needlework and washing, and doing all the work of the house and garden. Although one of the rooms was fitted up as a chapel for daily worship, the girls attended Divine worship at a neighbouring church. It was also noted that the Reformatory was almost full. Over the next two years, the premises were enlarged to increasing the accommodation to around 100 places. The new extensions were officially opened on October 26th, 1864. The ground floor included a refectory, 30 feet by 20 feet. At one end of the tiled corridor were the schoolroom and the workroom, each 36 feet long by 20 wide. At the opposite end of the corridor was a wide stone staircase, giving access to the dormitory above. This was large and well-ventilated, 110 feet long by 30 wide, with a roof of open timber work. Heating was by means of hot-water pipes. On the same landing was an infirmary, with a room for infectious cases, and a cell for refractory inmates. The new wing was built by Mr. W. Reynolds, from designs by Messrs. Hadfield and Son of Sheffield, at a cost of £1,700. St Joseph's still lacked its own proper chapel, with the residents using one on Solly Street, a mile or so away. One was eventually built, largely due to Sister Stephanie's fund-raising efforts, which included a donation of £1,000 from the Duke of Norfolk, a similar amount from the Gainsford family of Darnall, and around £500 from members of the St Joseph's management committee. Construction work on the chapel commenced in May 1871. The architects were again John Hadfield and son. Because it was built on a sloping site, the design was able to include school rooms underneath the chapel. The building had both an external entrance for the public, and a private one for the Sisters and girls which connected directly to the Home. 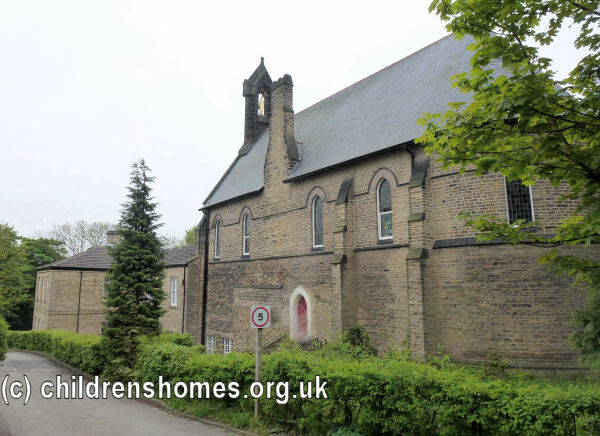 The new chapel was formally opened on April 21st, 1872, by Canon Walshaw, the Rector of St Marie's Church, Sheffield. The School site is shown on the 1894 map below. St Joseph's Home site, Sheffield, c.1894. Following the decision to close the Industrial School for Roman Catholic Girls at Kirk Edge in 1887, St Joseph's was re-opened as an Industrial School, taking the former Kirk Edge inmates. The St Joseph's Industrial School for Roman Catholic Girls was formally certified for operation on September 24th, 1887, with accommodation up to 100 girls, aged under 12 at their date of admission. In its new role, St Joseph's continued to receive consistently good reports. The large laundry provided employment for the older girls, who also received cookery lessons. All the girl were instructed in needlework and knitting. In 1889, it was noted that musical drill had been introduced. In the same year, St Joseph's Roman Catholic School, also run by the Daughters of Charity, was opened across the road from the Home. The younger girls subsequently started attending the school. Sister Stephanie's lengthy tenure as Sister Superior came to an end with her death in December, 1897. She was succeeded by Sister Magdalen. January, 1910, was marked by the opening of a new schoolroom by the Coadjutor Bishop of Leeds, assisted by 12 clergy of the city. The girls contributed a musical performance to the proceedings. The schoolroom could be divided into three classrooms by glass partitions. A new dormitory, linen room, sanitary blocks and lavatory also came into operation. That year's inspection noted that most of the girls could cut out and make by hand or machine ordinary articles of underwear, while nine of the senior girls had taken a special class in technical dressmaking. A sergeant was attending weekly to take military drill. Picnics and entertainments were enjoyed and there had been a gathering of old girls who were in service in Sheffield. These had been a day's outing to Cleethorpes. St Joseph's officially ceased its operation as an Industrial School on December 14th, 1931, and the existing residents were transferred to Blackbrook House, St Helens. In 1934, the Howard Hill site re-opened as St Joseph's House for Mentally Handicapped Women and Girls, providing care for patients from all over the country who were referred through local Catholic organisations. In 1971, management of the hospital was handed over to the Sheffield Hospital Board. The following year, its control was placed under Meanwood Hospital. From 1970, the hospital had to make educational provision for patients who were of school age, with teachers and child care assistants being brought in. 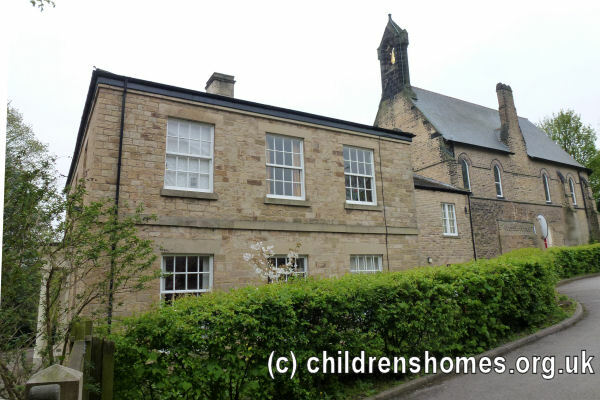 Perhaps because of the ever increasing involvement of outside agencies in the running of St Joseph's, the Daughters of Charity decided to withdraw from St Joseph's and in 1974 departed to take up residence at Ashdale Road in the Broomhill district of Sheffield. The hospital was closed in around 1980 and the hospital accommodation demolished to be replaced by modern housing. Only the original Howard House and the adjoining chapel now survive, occupied since 2002 by the Sheffield Buddhist Centre. Daughters Of Charity Of St Vincent De Paul, Provincial House, The Ridgeway, Mill Hill, London NW7 1RE. (Archivist: Sister Bernadette Ryder DC) Has Baptismal register and certificates (1893-1922).